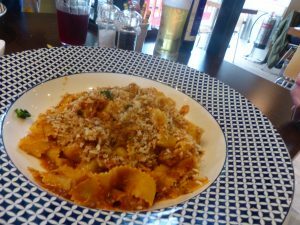 We recently had the pleasure of visiting Carluccio’s in Cardiff Bay. We were instantly greeted with a warm welcome by Clare, who was the manager on shift that day. She kindly showed us to our table and left us with menus to browse over. 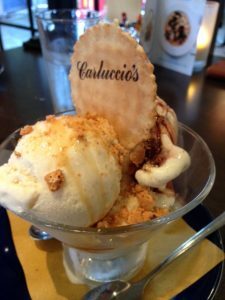 Carluccio’s is located close to the Bay and there’s plenty of glass windows surrounding the building, combining the feeling you are outdoors with the comfort of being inside. Good job, too, as it was hammering with rain outside. The warm atmosphere, though, certainly didn’t dampen our spirits. Not long after, our waiter for the evening, Gideon, introduced himself and took our drinks order. He was so friendly giving advice about the menu choice, needed as I was completely undecided between two dishes. For the adult mains, we chose Beef Ragú Linguine. What is this, you say? 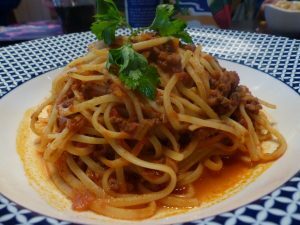 It is spaghetti bolognaise, so don’t be fooled by the name. We also chose Duck Pappardelle: a slow cooked duck, pork, pancetta & mushroom ragù, topped with garlic breadcrumbs. 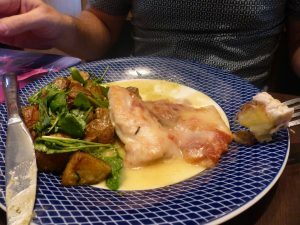 The last adult main was Chicken Saltimbocca: Chicken escalope, topped with 14-month aged prosciutto Gran Sasso and sage, with a white wine sauce. This was served with roasted potatoes tossed in pesto and rocket. Bruschetta is one my personal favourite starters. As no one was having a starter, we chose to order some as a side dish with our main meal (naughty, I know). 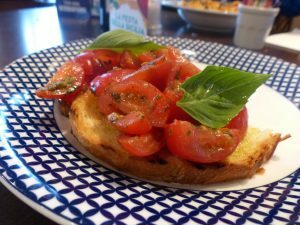 The bruschetta was packed with fresh tomatoes and the basil just enhanced the taste to levels of pure deliciousness. Don’t just take my word for it though. I think this image alone speaks volumes. There’s a Children’s set menu for £6.95 but, get this, children can eat for a £1 between 12-5pm, I repeat only £1… Running until the end of August, children aged 10 and under can order a main dish, dessert and soft drink, all for just £1, between 12 noon and 5pm at any participating Carluccio’s branch. What is not to love about that! 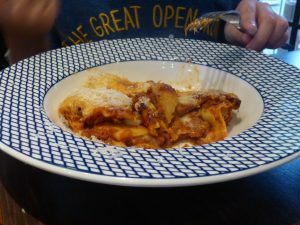 My children chose spaghetti bolognaise and lasagne for their mains. As we all chomped into our delicious food, we were still waited on by Gideon, who went out of his way to see if we needed anything else and if we were happy with our food. No one was disappointed with their main meal and, aside from my 6-year-old, nobody left any food whatsoever. What my daughter left was put in a small container, so she could take it home to eat later (no waste – even better). 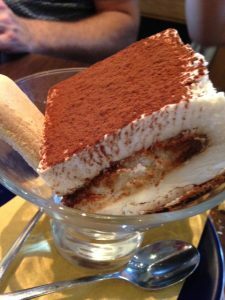 I, personally, had no room left for dessert after my delicious Beef Ragu Linguine, but the rest of the gang ordered Tiramisu, Chocolate & Salted Caramel Sundae and Ice Cream. I don’t think anyone can disagree that these desserts look delicious and the feedback from everyone around the table was complete satisfaction from the bursting with flavour desserts. 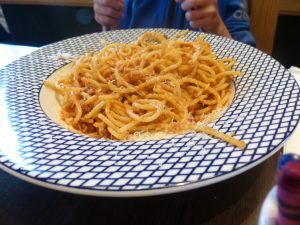 To sum up our experience at Carluccio’s, the menu was extensive, the food was really tasty, and the service was excellent – in particular Gideon, who went out of his way, especially with the children. Nothing was too much trouble. We wouldn’t hesitate to return because our experience was fantastic. Taxi! The menu features a choice of classic Italian family favourites including lasagne, creamy macaroni cheese, deliciously moreish lemon ravioli filled with ricotta and pine nuts, and chicken Milanese served with rosemary roasted potatoes.